Saturday evening Scott and I got ourselves minimally gussied up and went out on a little date. I know! This all came to pass after Annelise, the persuasive and persistent child that we know and love, invited herself over for a sleepover at Pappo and Grandma's house. After eating delicious fajitas at Lupe Tortilla (which has now earned a spot in our Tex-Mex rotation) we made our way to Cinemark to see the new movie RED. I am a sucker for spy movies. Plus seeing Helen Mirren wielding a machine gun was priceless. She does everything with class. Bruce Willis was actually somewhat low-key and not all Die Hard-y, so it was highly enjoyable. Mary-Louise Parker was quirky and adorable, John Malkovich always plays the best lunatics and Morgan Freeman rounded out their ragtag spy team perfectly. Scott and I always rate movies on whether they are full theater price worthy, matinee worthy or wait for the DVD worthy. We both agreed it was worth the full price, though we would have certainly caught the matinee if we could have. 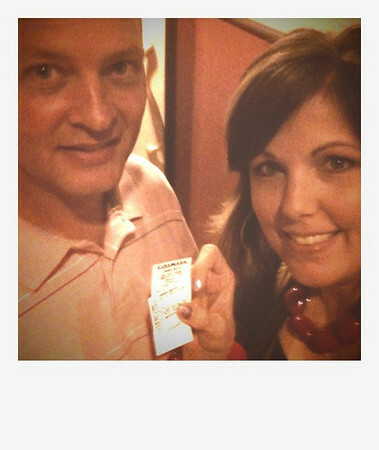 When we arrived at the theater Scott immediately began to stress when he saw the lines in front of the ticket windows. It's so romantic to be dropped off in front of the theater while your husband parks the car so you won't risk missing the previews. As I bypassed the long lines and stepped inside to wait my brief turn at the automatic ticket thingies I wondered why more people don't use them. Why do they feel obligated to stand in a line outside, in all forms of weather, to purchase tickets from a disgruntled teenager mumbling through a plastic hole? I waited for one other couple to buy their tickets before it was my turn and I had our tickets in my hot little hands by the time Scott came in. We had plenty of time to find seats and see the previews. It makes or breaks a marriage. Seen any good movies lately? Do you feel all is lost if you miss the previews? Do you use the automatic ticket thingie or buy your tickets outside the theater? I LOVE the automatic ticket thingy! Although there have been times I have run inside to use it only to find it out of order and then have to get in line behind where I would have been in line. Oh well. Thanks for the review on the movie, I want to see it! Previews are an essential part of the movie theater experience. I have to see them. Sometimes they are better than the movie. I have used the automated ticket machine and it is awesomesauce. I am waiting for Harry Potter and Voyage of the Dawn Treader to come out before I go back to the theater. I miss movies though, since having kids. I almost always use the ticket thingy inside because there is never a line. I always wonder the same thing- why aren't people using it? But I am also secretly glad they don't- because that means I get the short line. And yes, I MUST arrive at the theater VERY early so as not to miss a single preview. I love the previews! We saw Life As We Know It on Sat. and it was adorable! So cute! we love the auto ticket machine, but try to miss previews! my nephew told me Secretariat is good, but he is getting better...he would not tell me about it; "no spoilers!" Rhonda: Hope y'all get a chance to see it, we both enjoyed the action/comedy. Nicole: I'm looking forward to the Harry Potter movie too! I've never seen one in the theaters but now that I'm officially a Potterite after reading all the books I can't wait. Silken: We want to see Secretariat too--Annelise has been begging to see the horse movie so she can see a baby horse be born. Kim: Yes! Their fajitas were tangy and tender--we'll definitely be going back! I wonder if we were there close to the same time? I'm glad to know that movie is Full-Price Worthy. I won't be seeing it any time soon probably, but will be looking forward to it at least. I use the automatic ticket machines too. The lines at the teenager window are always ridiculous!